Washington County Museum permanent exhibit focusing on Native-American culture updated. 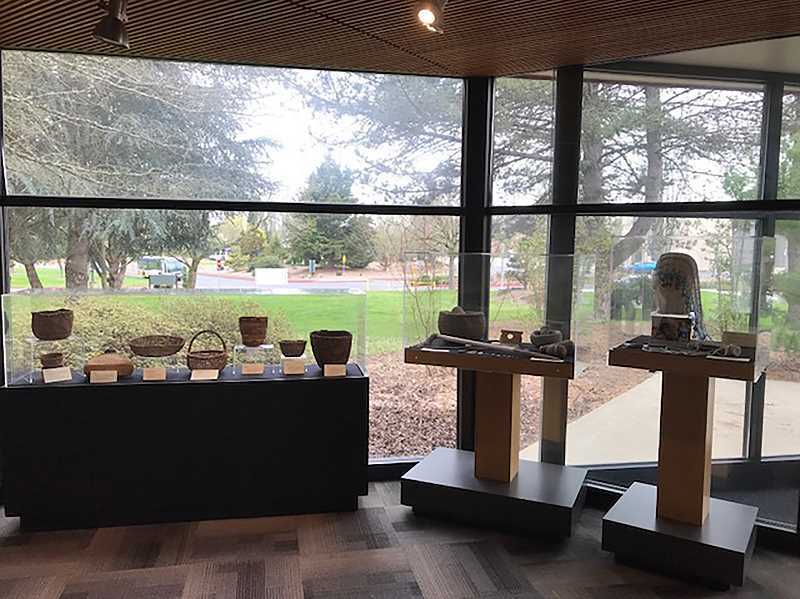 Visitors to the Washington County Museum this month have likely noticed a few changes to the museum's permanent exhibit about the Atfalati band of the Kalapuya, the indigenous people native to the Tualatin Valley. The recently updated exhibit "This Kalapuya Land," features new, authentic artifacts and highlights the lives of Washington County's earliest residents. The museum, located at Portland Community College's Rock Creek campus, 17677 N.W. Springville Road near Hillsboro, has had an exhibit on indigenous peoples since 2004, said Washington County Museum curator Liza Schade. But the exhibit wasn't as accurate as the museum wanted. Some pieces in the exhibit were not local to the area, and others had never been identified at all, Schade said. The museum worked with the Confederated Tribes of Grande Ronde to create the new exhibit, detailing Kalapuya history and culture. "I want people to learn about the incredible lifeways of the Atfalati band of the Kalapuya, to be local and accurate to our area, and to help forge a better relationship and show respect by getting expert advice from a local expert and tribal member," Schade said. Stephanie Craig, a member of The Confederated Tribes of Grand Ronde, was able to identify much of the museum's collection of Kalapuyan baskets, some of which date from the late 1850s. Craig also loaned a few pieces of her own collection to the museum, including a traditional-style bridal head dress. The head dress is made of dentalium shells and decorated with red, yellow and blue beads, Chinese coins and Mother of Pearl, Schade said. Craig's expertise has proven invaluable in making the exhibit more specific to the Tualatin Valley, Schade said. "I am proud to work with Stephanie Craig," Schade said. "She was so wonderful to take time out to help us and to identify some of the unknown pieces in our collections." Visitors to the museum can physically touch a cedar skirt panel that hangs on the wall, and imagine what it was like to wear one and feel it on their skin, Schade said. By talking to visitors about these things, Schade said, visitors come away with a greater understanding of the Atfalati people, how they navigated their local environment and the systems of human culture they lived in. "We want visitors to understand that indigenous life was just as complicated as any other, not at all simple as history books in the past have portrayed it," Schade said. Craig said the exhibit serves as a reminder that Native American history is still in the making. "(The Kalapuya exhibit) shows that we are still here, in the present. We aren't all gone, a dead or lost culture or past tense," she said. "We are still here, we still speak our language, we still eat traditional foods, hunt and fish for our way of life and we practice and pass on our traditions daily." People of all ages are interested in the history of Washington County's native peoples, Schade said. "As curator, I have talked to people ages 8 through 80 about the Kalapuya and had the same levels of interest and enthusiasm from all," she said. A lot of people ask about the objects on display, Schade said, which is a great way to teach people about Kayapulan culture. "When they ask what a digging stick was used for, we can show them one and explain that Kalapuyan women gathered camas bulbs from large oak savannah-meadows every spring and summer, to roast in underground fire pits and trade for salmon and other goods," Schade said. In the future, the museum is planning a basket-weaving workshop with Craig. She plans to teach the public how to make tule baskets and will talk about her tribal heritage in the Tualatin Valley. The museum also has a "Mobile Museum" program, which tours local elementary schools across the county, teaching young students about the Kalapuya. Schade said the goal of the exhibit is to teach accurate facts about the Kalapuyan bands who once lived here. Schade said they aim to teach the public to respect the ancient traditions and to preserve them, as well as to empathize with the hardships the tribes went through and learn to honor the tribal past through inclusion today. "It is incredibly important to teach the public to respect and honor the past and to forge new relationships and heal old ones," Schade said. "This will ensure that we can continually include and tell the true histories of the indigenous cultures of Oregon and this Tualatin Valley."